As the AAP-led Delhi government completed its three years to power on Wednesday, Chief Minister Arvind Kejriwal announced his future plans that include roads and drains in unauthorised colonies, building of 900 Mohalla Clinics, and funds for free WiFi.He also attacked the Central government for stalling the development works in the city and said he could prove wrongdoing by it if its files were made available to him.Addressing an event here to mark the third anniversary of the AAP government, Kejriwal said that from next month, the government will start installing CCTV cameras in the city.About free WiFi in the city, he said that his government is going to allot full budget to implement free WiFi in entire Delhi.The Chief Minister said to control pollution, landscaping would be done on vacant land on both sides of the roads by planting grass and trees to curb spread of dust. "There will be budget provision to do landscaping on 500 km of roads," he said, adding that a round the year study will be done to understand the various factors of pollution better. Kejriwal also said that whichever department digs up roads in the city, it will have to repair it irrespective of the land-owning agency as dug-up roads cause a lot of pollution due to the amount of dust. He added that he had met Lt. Governor Anil Baijal in this regard and both the government and the Lt. Governor are on the same page.He said that there will be a massive investment in the next one year on construction and repair of roads. "We will try to complete roads and drains in the kachhi (unauthorised) colonies in the next one year. "In the next two years, every house in Delhi will get water through pipelines," he said, adding that they would not need tankers after that. 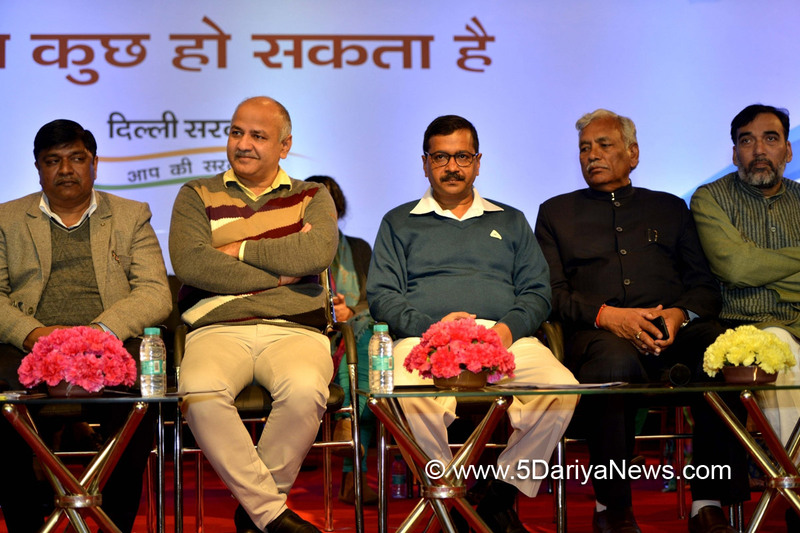 He also said that he believed that all 1,000 Mohalla Clinics will be operational by end of the year. "Land for 786 Mohalla Clinics have been identified. LG has given permission and funds have been allocated. I believe all Mohalla clinics will be built and they will start operating in the next six to nine months," he said. He also said that 120 polyclinics would be ready soon. Also pointing out that in the last 70 years, governments only arranged for 10,000 beds in Delhi government hospitals, he promised that there would be a 30 per cent increase in these. "We would install 3,000 more beds by next financial year," he added. Citing other initiatives taken by his government, he said electricity rates have not increased for last three years - making for the cheapest power rates in the country - and around 7,030 classrooms have been built - against 800 by the Congress in 15 years of rule.His deputy Manish Sisodia said the government has opened 14 new colleges. Holding the government's dream was to have people from private schools coming to government schools, he also said the government was working to provide good quality education to the 26 lakh students of the city.Sisodia said that apart from the increase in infrastructure of schools, the involvement of parents and teachers was the key reasons for the improvement in quality of education in government schools.Answering a student's question for a message on Valentine's Day, the Chief Minister said: "Hate cannot be answered with hate. Love will conquer the world. People have to collectively stand against divisive politics".